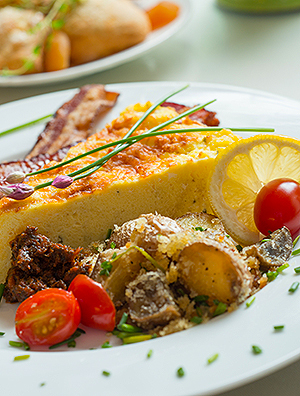 On some occasions, potatoes may accompany the savory breakfast entrée we serve at the Inn. These potatoes were created for the 2014 Inn to Inn Herb Tour. The same recipe can be varied by adding a different herb such as rosemary instead of the chives and lemon zest. Though steak is not on the breakfast menu at the Inn, these potatoes would be great to prepare with a ‘steak and eggs’ brunch for your family or friends! Sour cream and crumbled bacon for garnish if desired. Wash potatoes and place in a large pot; cover with cold water and add salt. Bring to a boil and simmer over medium-high heat until just barely tender, about 10-12 minutes; drain. Dice warm potatoes into about ½ to 3/4 inch cubes (do not peel).Meanwhile, preheat oven to 425 degrees F. Combine breadcrumbs with roasted garlic olive oil, add the potatoes, and toss gently. Spread potatoes on a baking sheet lined with parchment paper and roast in oven until golden brown, about 10-12 minutes. Sprinkle with Parmesan cheese, toss gently, and roast an additional 5 minutes.Remove from oven and sprinkle lemon zest and fresh chives over the potatoes, toss to distribute and season to taste with sea salt and freshly ground pepper. Makes 6-8 servings. * To make roasted garlic olive oil, steep smashed cloves from one head of roasted garlic in 1 pint extra virgin olive oil for at least 24 hours. Keep refrigerated.